Russell Finex was pleased to exhibit at another successful International Powder & Bulk Solids Conference and Exhibition from April 24 – 26, 2018. Also known as the “Powder Show,” the biennial event was hosted by UBM at the Donald E. Stephens Convention Center in Rosemont, IL. As North America’s largest processing event, the show welcomed more than 3,500 visitors. Russell Finex was among a record number of exhibitors on-hand to showcase industry goods and trade information. On display was a variety of high-capacity machines that sort, sift and separate, ideally suited for the food and pharmaceutical industries. Live demonstrations of Russell Finex award-winning equipment were a big hit and drew crowds over the course of the three-day event. Prospects and suppliers watched the superiority of Russell industrial sieving and filtration equipment in action. One such machine was the Russell Compact 3in1 Sieve™. The demonstration allowed onlookers to better understand how it protects operator health by allowing for safer sieving of hand-fed materials, with its comfortable height of the bag-tipping platform and the reduction of harmful dusts. The Russell Vibrasonic® Deblinding System made for an impressive display as well. It was fitted to a Russell Compact Sieve® to demonstrate patented technology from Russell Finex which increases sieving capacity down to 20 micron and eliminates mesh blinding of various powders and bulk solids with ultrasonic frequency. Last, but not least, the Finex Separator™ was used to showcase the Russell Screen Changer™, an award-winning pneumatic screen deck lifting system. Suitable for most circular separators, the Russell Screen Changer™ showed the ease with which operators can inspect and change the screens of graders and sorters, without the hassle of dismantling the machine. 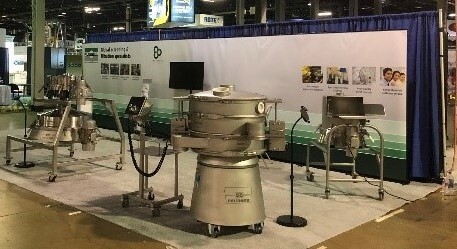 Russell Finex demonstrated and displayed the high-quality equipment for which it has become a sieving and separation authority for more than 80 years. An industry expert, it manufactures and provides efficient fine mesh separation solutions to many industries including: food, pharmaceutical, ceramics, chemicals, metal powders and water processing. Known for innovative equipment that ensures operator safety, minimizes downtime and meets strict hygienic standards, Russell Finex has a sieving and filtration solution for your specific requirements. Contact us to learn more about the Russell Finex story and find information on new and aftermarket products.